Western Mountaineering Badger MF 15 Degree, 6'6 Length. 2017 Model - New with tags, storage sack and stuff sack. Stored on a display hanger on the sales floor.. Western Mountaineering's Badger MF 15 Degree Down Badger Sleeping Bag has more room in the shoulders and hips than traditional mummy bags, so you can move around while you sleep. Unlike most water-resistant shells, Western Mountaineering's MicroLite XP fabric offers long-lasting weather protection. The MicroLite XP shell helps the down retain its lofty warmth in moisture-riddled environments. Western Mountaineering's critical thought to the smallest details makes the Badger a long-lasting and very versatile choice. A differential cut places more fabric at the lining to ensure maximum loft inside the bag, and continuous baffles allow you to shift the bag's down towards the top or bottom for more or less warmth. Hook-and-loop tabs let you pull the hood, draft tube, and draft collar farther or closer to you for customized coverage. Extra convenient features include zippers on either side, a waterproofed stuff sack, and a storage sack with a large volume that helps the bag retain its loft overtime. Hood, draft collar, and draft tubes with hook-and-loop tabs. Zipper on left or right side. Differential cut with continuous baffles. Stuff and storage sacks included. [6ft] 66 in, [6ft 6in] 67 in, [7ft] 67 in. [6ft] 57 in, [6ft 6in] 58 in, [7ft] 58 in. [6ft] 41 in, [6ft 6in] 41 in, [7ft] 41 in. 6 ft, 6 ft 6 in, 7 ft.
[6ft] 23 oz, [6ft 6in] 25 oz, [7ft] 27 oz. [6ft] 2 lb 4 oz, [6ft 6in] 2 lb 6 oz, [7ft] 2 lb 8 oz. 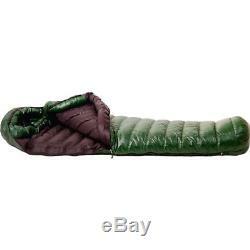 The item "NWT Western Mountaineering Badger MF 15 Degree Down Sleeping Bag 6'6 Left Zip" is in sale since Monday, October 8, 2018. This item is in the category "Sporting Goods\Outdoor Sports\Camping & Hiking\Outdoor Sleeping Gear\Sleeping Bags". The seller is "sylvan_peak" and is located in Red Lodge, Montana. This item can be shipped to United States, Canada, United Kingdom, Denmark, Romania, Slovakia, Bulgaria, Czech republic, Finland, Hungary, Latvia, Lithuania, Malta, Estonia, Australia, Greece, Portugal, Cyprus, Slovenia, Japan, China, Sweden, South Korea, Indonesia, Taiwan, South africa, Thailand, Belgium, France, Hong Kong, Ireland, Netherlands, Poland, Spain, Italy, Germany, Austria, Israel, Mexico, New Zealand, Philippines, Singapore, Switzerland, Norway, Saudi arabia, Ukraine, United arab emirates, Qatar, Kuwait, Bahrain, Croatia, Malaysia, Brazil, Chile, Colombia, Costa rica, Panama, Trinidad and tobago, Guatemala, Honduras, Jamaica.